New swag! Check out the latest KXT design from local artist Brent Ozaeta! 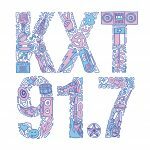 You can snag his design when you support KXT during our 2019 Winter Membership Campaign.